A new species of dinosaur has been identified 30 years after its fossilised remains were discovered. Fruitadens haagarorum, researchers say, is one of the smallest dinosaurs known to science. In the Royal Society journal Proceedings B, the researchers say that the dinosaur weighed less that 1kg. The fossils have been housed at the Natural History Museum of Los Angeles County since being discovered in Colorado in 1979. According to the researchers, the tiny dinosaur was agile and a fast runner. It lived in the Upper Jurassic period, about 150 million years ago. It was a member of a group of dinosaurs called the ornithischians, which were largely plant-eating creatures that included the far more imposing Triceratops and Stegosaurus. It would have darted between the legs of some of the largest known long-necked sauropods, such as Brachiosaurus. 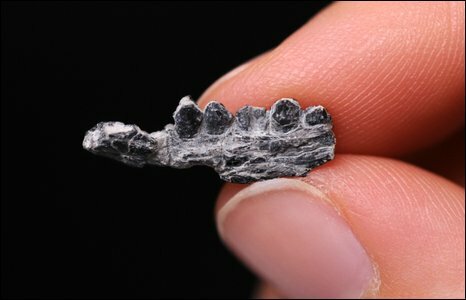 The study that identified the diminutive creature was led by Richard Butler from the Bavarian State Collection for Palaeontology in Munich, Germany. He told BBC News that examination of the dinosaur's teeth had revealed Fruitadens was probably an omnivore - eating smaller animals as well as vegetation. "This is unusual for that group - most of them were strict herbivores," he said. "But if you're small, it's hard to feed on just vegetation, as it's difficult to digest." Bigger animals with much larger guts were better able to survive on a plant-only diet. The genus nameFruitadens refers to the area of Fruita in Colorado, where the fossils were first discovered. "Fruitadens comes from a series of rocks, the Morrison Formation, which palaeontologists have studied intensively for 130 years, and from which dozens of dinosaur species are already known," said Dr Butler. "Yet it is still possible to discover completely unique and remarkable species. If dinosaur ecosystems were that diverse, who knows what astonishing beasts are waiting for us to discover?"